If use the Photovoltaic controller charge the battery directly, when the solar illumination is week, in pursuit of maximum power, and the output voltage will be unstable. Then the Photovoltaic battery array hardly maintains the rated voltage when charging. At last, it leads to the solar system cannot charge the battery when in the range of the solar illumination. The application of super capacitor module will collect the unstable output energy, after reaching the suitable voltage (Von), the module will release these collected energy to battery. 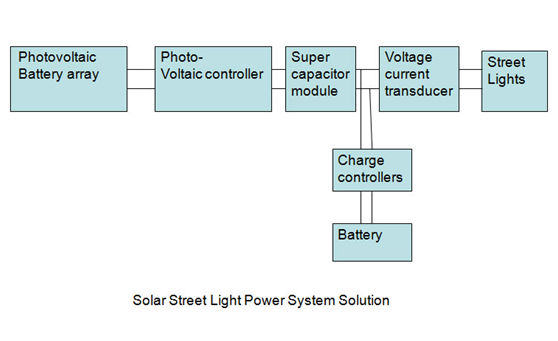 In this way, the module can improve the efficiency of power generation when the solar illumination is week. If the voltage of GTCAP super capacitor module below the stated min voltage Voff, then the module will stop charging the batteries, the Photovoltaic controller will charge the module at the maximum power output; When the voltage reaches enough voltage Von(Von>Voff), the module can start to charge the battery. So it is a continuous process, charging and discharging.